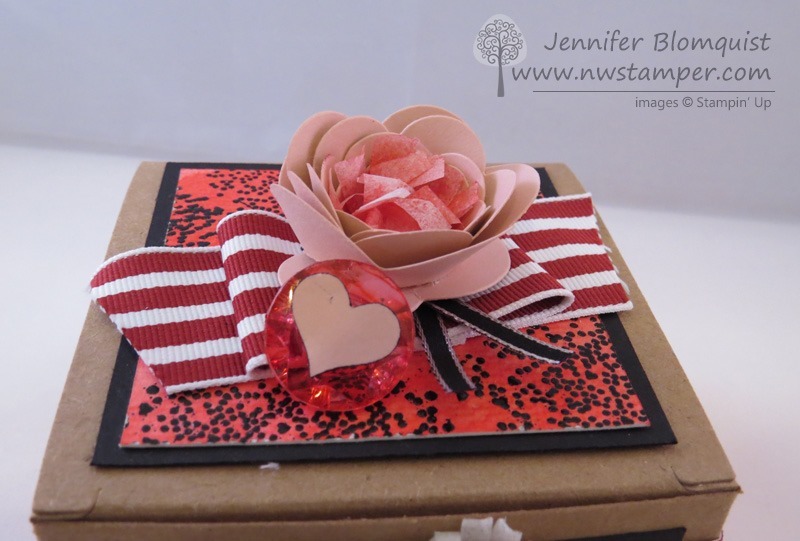 Seasonally Scattered Valentine's Box & NEW Product Shares! 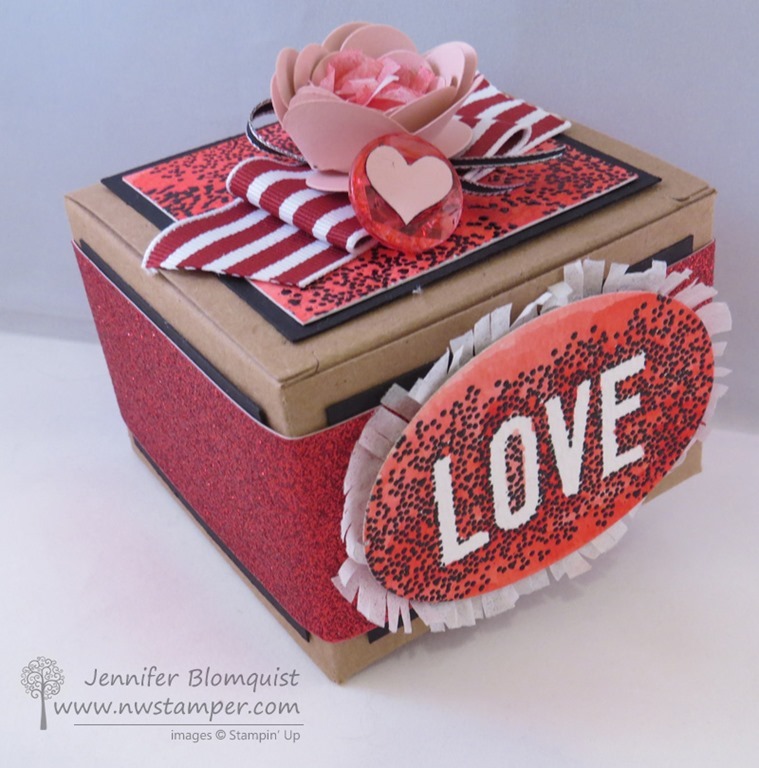 Seasonally Scattered Valentine’s Box & NEW Product Shares! You’ve probably seen my projects and others using Seasonally Scattered and many of them were focused on the Thanks and Merry sentiments. You know, because they fit so well for fall and for winter. But before the stamp set disappears in a couple days (last day to snag it is Jan 5th!) I wanted to share this project I created for the Convention Display boards this summer. See?! Now do you see why I can’t believe this set is not continuing on for Valentine’s Day? Anyway, I had lots of fun making this box and you could totally use bits and pieces from the box to make a card or make your own special box for someone you love. Use the kraft gift boxes for your base. They are very inexpensive easy to pop together, and very sturdy for your box. Start by heat embossing your LOVE image onto a piece of Watercolor Paper using versamark and black embossing powder. 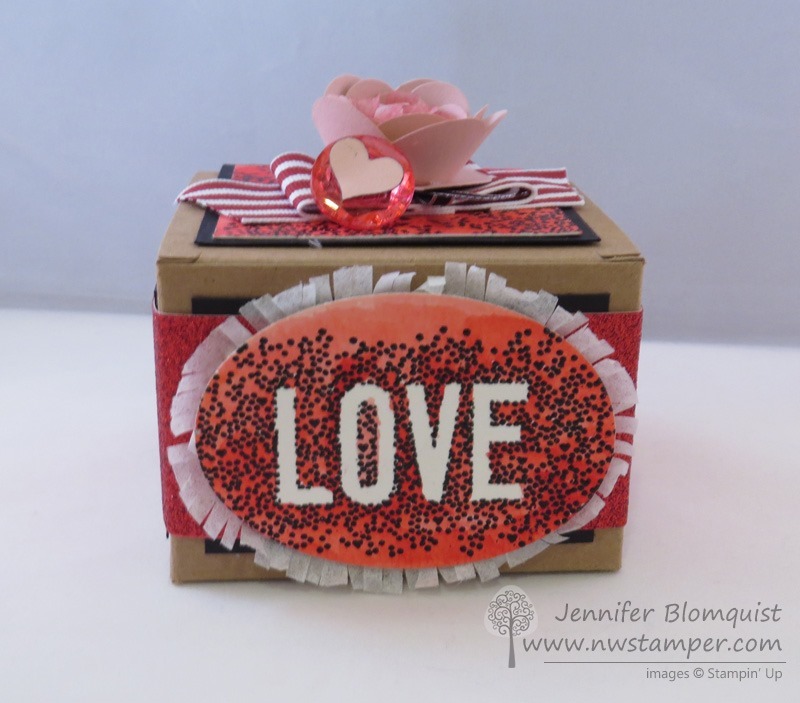 Use the Aqua Painter and your Real Red ink pad to color in the paper EXCEPT for the “LOVE” sentiment. NOTE – when picking up color with your Aqua Painter, make sure to pick up the color from your ink pad LID and not the surface of the pad itself to avoid diluting your ink pad in one spot. Cut out the sentiment using the Oval framelits and then cut out a bigger Oval from the white crepe filter paper. Fringe the edge of the larger oval and layer behind. Stamp around the edges and heat emboss another piece of watercolor paper for your top using just the scatter design portion of the LOVE stamp. This gives you the coordinating look on top. Add a spiral flower using the Spiral Flower die (use glue dots or liquid glue to hold your flower together) and add some watercolored scraps of the filter paper to the middle of the flower for filler. Did you know? You can color the Vintage Faceted buttons with your Blendabilities to make them custom fit your projects? That is what I did here with my Cherry Cobbler blendabilities! And there you have it, a great little box for that special someone for Valentine’s Day or any time of the year. Try it all out first with my Product Samplers! The details are up! In 2 days (or as I get the shares filled), I’ll be placing the order for everyone’s samplers of the newest papers and accessories from the spring Occasions catalog! This is a great way to try it all out without breaking the bank paying for full packs of everything. Then once you see it in person, you can decide which items you love and which you are good with just a couple pieces. It’s a win-win! BONUS – this year I’m offering a bonus to everyone who signs up for the “I Want it All” sampler and you get a bonus sampler of the coordinating Sale-a-Bration Paper, Ribbon, and Buttons! That’s a whole lot of goodies for only $26 (plus shipping if needed). Email me at jennifer@nwstamper.com to reserve your spot today!